He’s royal, historic and terribly obscure. But he’s more dashing than Donald. Thanks to Bevin for suggesting another one from her family tree. Today’s Name of the Day is Donncha. There are a raft of possible variants for the Gaelic Donncha, including Donnchadh, Donnchad, Donough and Donagh. They all come from donn – brown and chadh – warrior. None of them are terribly accessible to American English speakers – in fact, the most common translation of all is the eminently wearable Duncan. 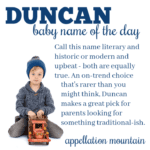 Then again, Duncan might sound too trendy for parents seeking an authentic heritage choice. While he only ranked #717 in 2008 – and has never climbed higher than the 300s – with so many two-syllable, ends-in-n names for boys in use, it’s no longer the most distinctive sound or rhythm. Elisabeth at You Can’t Call It “It” spotted at least one Donncha in a British birth announcment. And we all know that the Americans often follow the English, adopting their favorites a few years later. Still, Donncha’s pronunciation is a possible headache. While DUN uh is probably the most accurate version, it’s easy to imagine Donna coming out instead. On a playground full of boys called Noah and Ezra, that might not be a disaster. Even a saint – though the eighth-century priest is also referred to as Dunichad and was often Latinized as Donatus. Would a modern parent choose Donncha for a son? It’s hard to say. One indicator is over at BabyCenter, where he’s barely a blip on their charts. Likewise, Namipedia and Nameberry give Donncha the miss. And while the nickname Don is worn with style by television characters Don Draper of Mad Men and Don Flack of CSI:NY, it is still far from fashionable. Overall, Donncha is intriguing. His history makes him a viable contender for an Irish heritage choice. But he could be tricky to wear for a boy circa 2009, and isn’t nearly as likely to catch on as Duncan, Callum or Cormac. Of course, that might suit some parents just fine. My son (and brother) are both named Donagh. I think what some of you might be missing is that is the Irish ‘o’ is pronounced as a ‘u’ in English. Therefore Donagh phonetically would be ‘Dun-a’. Also the introduction to this piece is inaccurate. Rather than the name coming from the Irish for ‘brown’ or ‘warrior’ it is probably more likely derived from the Irish word for Sunday (Domhnach). In Ireland it is said that St Patrick always turned the first sod and consecrated his churches on a Sunday and hence you will find that many places containing one of his churches now contain the name ‘Donagh’. We had always thought to name my son after his uncle but when he was born on the feast of St Donagh it just seemed perfect. That’s interesting – it’s not a reference I’ve come across elsewhere, but even common names have inaccurate histories attached. I appreciate the insight. As for the pronunciation? You’re right about the o/u confusion, but I still think that you’d be challenged to find an American English speaker who would correctly pronounce Donagh without some coaching. Living with someone who grew up bilingual, I’m often forced to admit that I just can’t make certain vowel sounds perfectly – nor can I hear the distinction. I’m sure it is incredibly frustrating. Haha, oh dear. Americans and most non Irish speaking people do seem to have a problem pronouncing my name. I’ve heard and read every sort of misspelling of it. It’s amazing when someone will reply to a comment on my post or reply to an email addressing it to “Donna”. On a more positive note, I emailed a New Zealand radio station after the recent earthquake there. The DJ read out my email, even pronouncing my name perfectly. Well impressed! Oh yes, Google for “donncha”, plenty to see there! Sorry, Donncha, we Americans are a proud,ignorant people. Also wooden-headed and myopic, but mostly proud. If only we were just bad at names! We’re not even alarmed when our president takes us into war without explicit declarations from the legislature. You can imagine the ensuing hilarity! But I digress. You have a respectable Gaelic name, and I apologize on behalf of us all that you’re doomed to be “Donna” in this country. What? Who wasn’t alarmed? I was alarmed! Sarah Palin? That’s an interesting association, though I really don’t get it. I have to hate this name. It reminds me too much of Sarah Palin. “Don’tcha” was honestly the first thing I thought when I read this name. I’m reasonably fond of Duncan, but don’t think this name could ever really grow on me. In northern Wisconsin, there’s often a think accent heard (also heard in the movie, Fargo) and all I can hear when I see this name is one of my northern Wisconsin relatives saying, “Don’tcha know!” with that very gutteral “o” sound. At first glance, I thought this would be a rare Slavic female gem. I don’t know why, maybe because it reminded me of the Polish Danuta or Danka. Now that I know its a male name, I can’t say that I like it too much. It still seems offly feminine, but its a refreshing name of the day choice, as I wasn’t quite expecting to see something like this. I always love to hear about new, legit names, even if I like them or not. Donncha. Hmmm, my take on it is that most people in the U.S. would read it phonetically. When I saw it I assumed it was a female name. I’m afraid this is one I won’t be recommending. Sorry, it just reads don’tcha to me. I think it’s really more of a creative name than I’m willing to use. On a different note, Verity, did you get my NotD emails? I suggested a few names (of course I can’t remember them now). More of a naming curiosity than a real contender, I would think. The spelling is much too impractical. Even Donogh would be easier, and that would be an uphill battle. Donn’cha do it. Argh, you beat me to it!